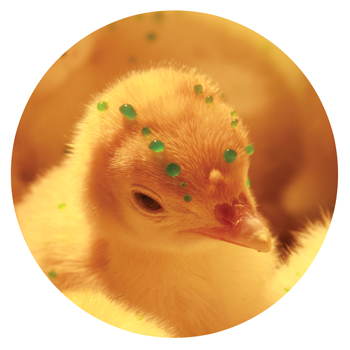 Gel-delivered vaccines and probiotics for poultry and swine. Gel-Pac and Underline are specially designed to prolong the viability and improve the effectiveness of reconstituted and diluted vaccines and probiotics in a gel that is convenient to prepare and easy for birds and pigs to consume. The stabilizers in this class of products (Vac-Pac,Vac-Pac Plus, Spray-Vac, Spray-Vac Spectrum, and Opti-Vac) has been formulated to counter-act the three most destructive agents commonly associated with both traditional and effervescent processes. For devastating respiratory infection within your hog and poultry houses. 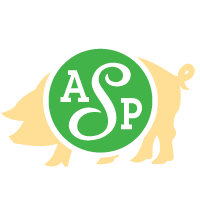 Animal Science Products offers a wide range of products to address your every day challenges. Some things are just better together…nuts and bolts, socks and shoes, pen and paper…all better when combined. But until recently, combining poultry coccidiosis vaccines with other live biologicals was not a good idea. But that has changed. What kept us from conveniently delivering cocci vaccine with other biologicals like bronchitis (IB) or Newcastle (ND) vaccines in the same spray solution? The answer is oxidation. It’s not that the vaccine organisms themselves aren’t compatible; all three of these vaccines function great when consumed orally. The problem is that some of the additives vaccine manufacturers put in cocci vaccines will threaten others unless they are properly stabilized. ASP has developed an ideal solution. They are surprisingly harmful, considering they cannot live outside the host for more than a few days1. 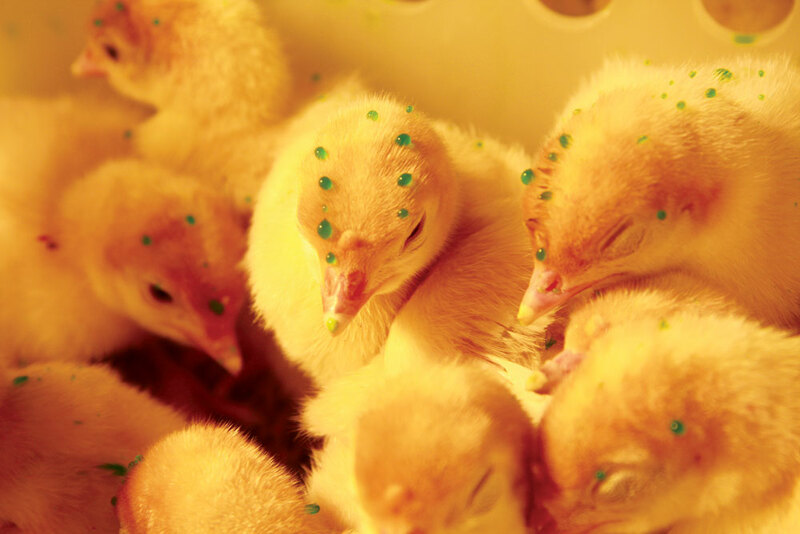 They are the Mycoplasma species, some of the most commercially relevant disease-causing bacteria for poultry producers. M. gallisepticum (MG) and M. synoviae (MS) owe their unique nature to a couple of key factors. 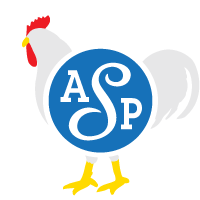 First, they spread easily, being the smallest bacterial pathogens known for poultry. Second, they are extraordinarily fragile due to a specialized characteristic…they do not have a cell wall, only a cell membrane. By themselves, Mycoplasma can hide reclusively in poultry respiratory tissues, harbored for life, and producing no noticeable symptoms. However they can, without warning and often when animals are stressed, blow up into acute, well-recognized diseases such as Chronic Respiratory Disease (in the case of MG) and Infectious Synovitis (in the case of MS)2. 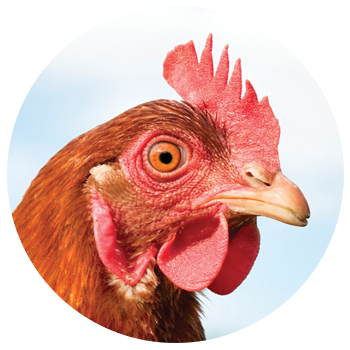 These diseases are complex because they result from interactions between the Mycoplasma and other respiratory infections such as Newcastle Disease Virus, Infectious Bronchitis Virus, and Avian Influenza. 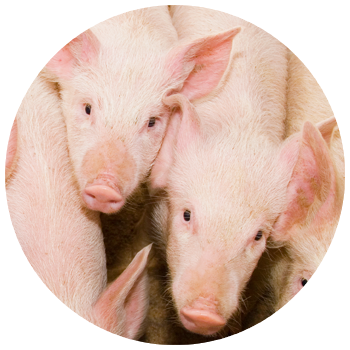 the pneumonia, diarrhea, septicemia and mortality in swine caused by Salmonella cholerasuis. It also controls another salmonella species, S. typhimurium, which is one of the common causes of food poisoning in people. Controlling these infectious bacteria improves swine production efficiency and can reduce the risk of human illness. Salmonella vaccines can provide effective control of salmonella when administered properly. 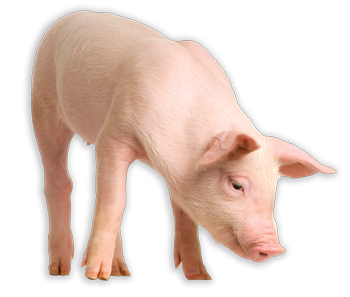 Unlike antibiotics, the avirulent live vaccine fights salmonella by activating the pig’s immune system, allowing the pig to recognize and defeat the more virulent organisms it encounters in its environment. To generate this memory and immunity, the vaccine must be alive when the pig receives it. Argus was developed exclusively for oral dosing through the drinking water delivery system. One of the product’s precautions is to avoid antibiotic use 3 days before or after vaccination, because the antibiotics could kill the vaccine and make it ineffective. The forest is murky as you quietly stalk your prey through the understory. Here, deep beneath the jungle canopy, dim morning and evening light gives you the edge. Why? Because your eyes are bigger than your brain and your food sources shine out to you in colors and intensities others can’t see. 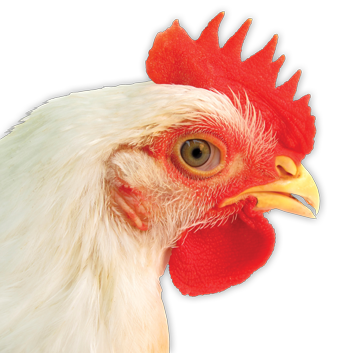 To you, as a jungle fowl, good vision is survival and you’ll pass this valuable trait on to your domestic poultry descendants. How would it feel if we, as humans, sported eyes as big as saucers and each weighing two pounds? Clearly your vision would be as important to your success as it is to the avian world. Now add the fact that, in addition to your eyes being huge, they had more types of color-receiving cone cells compounded with extra kinds of light-filtering oil droplets; all working to help you see a broader range of colors, and see them more brightly. There’s no doubt that poultry, having these adaptations and more, are built to see and react differently than the rest of us. You’ve noticed the sunshine drifting south. Now you’re trading daylight for dark as your days grow shorter and nights grow longer. Listen close and you’ll soon hear the telltale sound of migrating geese, their honks filling the airways and ringing in a cooler season. It’s a season that also brings vocal sounds from different airways, and if you’re on the farm you won’t have any trouble hearing it. Pigs coughing or thumping and poultry snicking and raling alerts you to a more threatening season- here it comes- flu season. Cool nights, temperature swings and reduced ventilation conspire against you, setting the stage for respiratory troubles. Breathe easier though, there’s a pair of products bringing pigs and poultry respiratory relief. Respiratory distress is a combination of airway inflammation and congestion caused by a multitude of infectious agents and irritants shown in the nearby table. Regardless of the infectious agent, the root causes of respiratory problems are airway inflammation and congestion. When you control inflammation and congestion, you’ve controlled the problem. 11 Years of no lost time accidents. 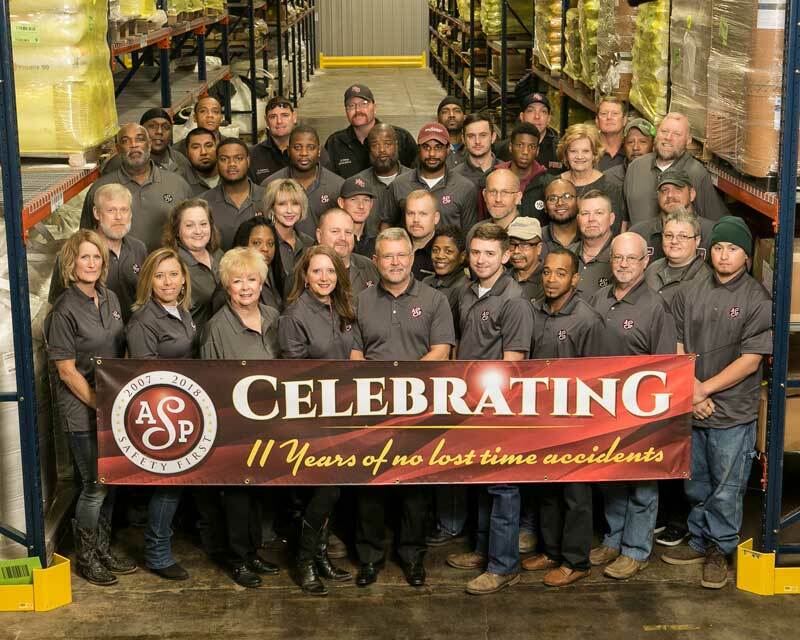 On November 26, 2018, Animal Science Products, Inc., (ASP) of Nacogdoches announced that their workforce has completed eleven years of operations without incurring a lost workday injury. This ongoing effort is in line with, and greatly surpasses, our employees’ previous record of safe performance, which included a period from July, 1997 to July, 2000 of over 1100 Safe Days. We are all aware of the effort required by employees to build a safety culture. We live it every day! This year’s company celebration included a breakfast served to the employees, after which a commemorative Eleven Year Safety plaque was presented to President and CEO, Bailey Reynolds. Mayor Shelley Brophy then conveyed a congratulatory message from the City. In addition, several members of our Fire Department joined the group. 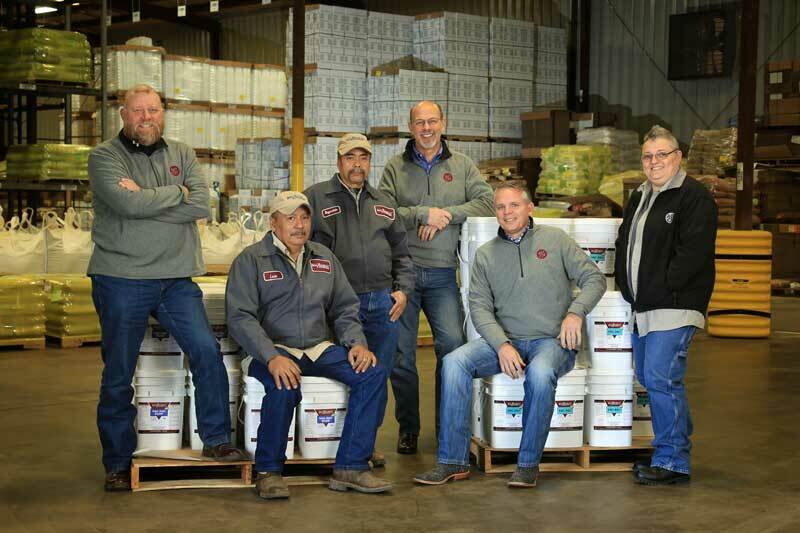 Animal Science Products, Inc. is a family owned and operated business that was founded in 1985 to service all facets of the feed and food animal production industry. The firm is a leading specialty package goods manufacturer. Today, ASP is a global leader in vaccine stabilization, offering products for drinking water, spray-on, gel, and ocular delivery. The company currently has sales in twenty-five states and over forty different countries. 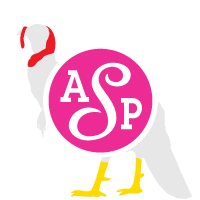 Please visit our website at www.asp-inc.com for more information. A customers Video advert for their local market. A new species-specific product line from Animal Science Products has been introduced to meet the needs of today’s health-conscious consumer. The face of animal agriculture is always changing; how we meet these changes will determine our joint success. 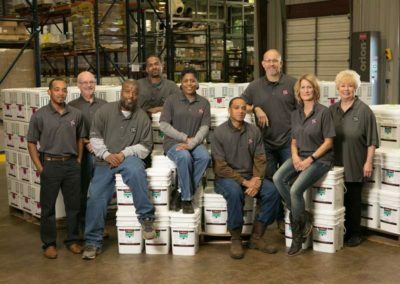 We are more than just great products – we’re a family-owned company devoted to serving our customers. 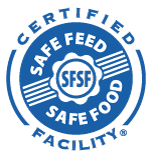 Animal Science Products has been proudly serving its customers in the feed additives and animal health industries for over 30 years. 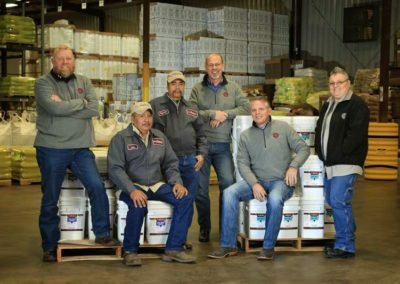 From the small northeast Texas town of Nacogdoches, ASP has delivered the highest quality products and professional service to feed manufacturers and livestock producers around the globe. We do so through a company-wide dedication to our processes, quality-assurance, innovation and customer attentiveness. We invite you to take time to learn more about our history, our mission as a company, and our team. It is the combination of all of these elements that have made us an industry leader and trusted supplier of animal nutrition products.